Life with Giggles: Latina VoxBox via Influenster! So, I signed up for Influenster a while back and told myself, if I get one, I get one. 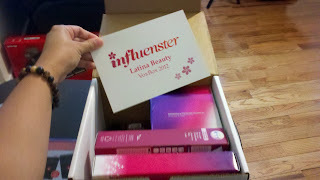 If not, then it's ok.
Well, I got picked for the Latina VoxBox!!!!!! See below for the goodies I received! The box was packaged in such a girly cute way! I jumped up and down for glee when I got it. 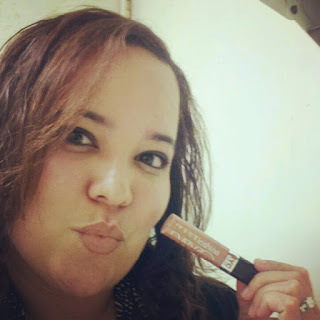 First product I tried was the NYC Liquid Lip Shine lip gloss. I am a full time user of lip gloss so that's why I chose to try this out immediately. I like it. Nice gloss and stays on longer than I am use to. Also, my lips were kept moisturized too. Below I got the Bath and Body Works new Shea Enriched shower gel. My scent was "Paris Amour". I finally tried this out yesterday and it was great. My skin didn't have that tight feeling after my shower and skin was soft through the night. Also, I have used the Hawaiian Tropic Silk Hydration more as a moisturizer and sunscreen. I like it because I suffer from Rosacea and this really hydrates my skin without the oily feeling and also, I NEED the sunscreen aspects of it too. It smells so yummy too... instantly get a smile when I put it on because it reminds me of summer time memories. That cute little bag you see is from the Always Radiant Infinite protection pads and tampons I received. How adorable is that??? Funny how this voxbox came at the perfect time for me to try out the feminine products... seriously, it was about four days later. The pads are super thin... you don't even feel like you have it on. And they are scented which isn't too overbearing. The tampons were a cute design on them and purple. Seriously, that's what got me. They make it look pretty! hahah. 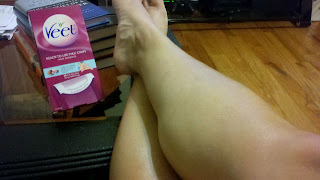 Luckily for Veet, I didn't shave my legs. So when this box came in with the Veet smooth wax strips, I waited a little longer to try it out on the short hair it is suppose to work on. The only thing I wax on my body is my eyebrows and mustache. This was my first time trying the legs. For me, it worked good. I just wish the strips were longer so you can use one all the way up and down the leg. It did take off the "short hair" pretty well considering it didn't have much to tug on. Also, they come with wipes to use after you wax which helps. Overall, the products were good to go! I highly suggest you grab yourself one of the NYC liquid lip shine glosses. That was my favorite out of all of them! Thank you Influenster!!! Go on over to their site and sign up!